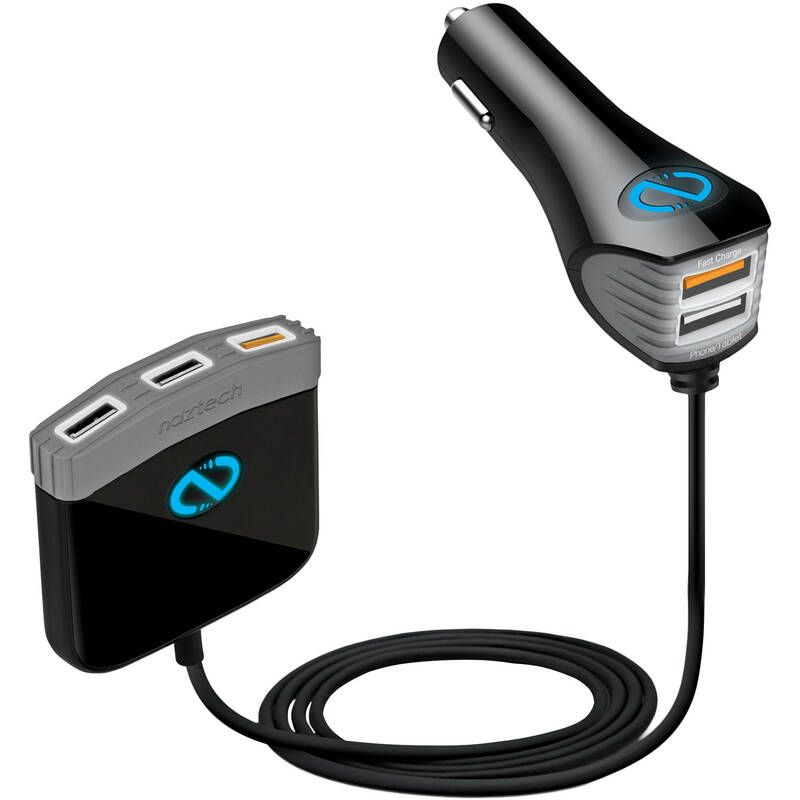 The Adaptive Fast Charge Roadstar 5-Port USB Type-A Car Charger from Naztech transforms your vehicle's lighter port into a five-port USB Type-A charger that can power multiple devices simultaneously. This car charger features two USB Type-A ports and three ports on the backseat hub, so everyone in your vehicle has access to rapid charging power. While every port is engineered to deliver a 2.4A maximum output to any USB device, the plug and hub each have one port that's enhanced even further with Adaptive Fast Charge technology. The two orange-colored Adaptive Fast Charge ports can power compatible devices like the iPhone X and Samsung Galaxy S9 from zero battery life to 50% in just 30 minutes. This charger also features IntelliQ Smart Chips, which will detect each device's power needs and automatically adjust the output for the fastest and most efficient charging. Additionally, get protection for your connected devices with safeguards like input overvoltage protection, overcurrent protection, short-circuit protection, and overcharge protection. The illuminated USB ports allow you to easily plug in your devices in dim or low light. Charge your favorite iOS and Android smartphones, tablets, cameras, Bluetooth headsets & speakers, eReaders, gaming devices, and more with ease. Box Dimensions (LxWxH) 6.5 x 4.9 x 1.7"